Mrs. Ida Arffa, 67, of 411 Fellows Ave, died yesterday at Crouse-Irving Memorial Hospital after a long illness. 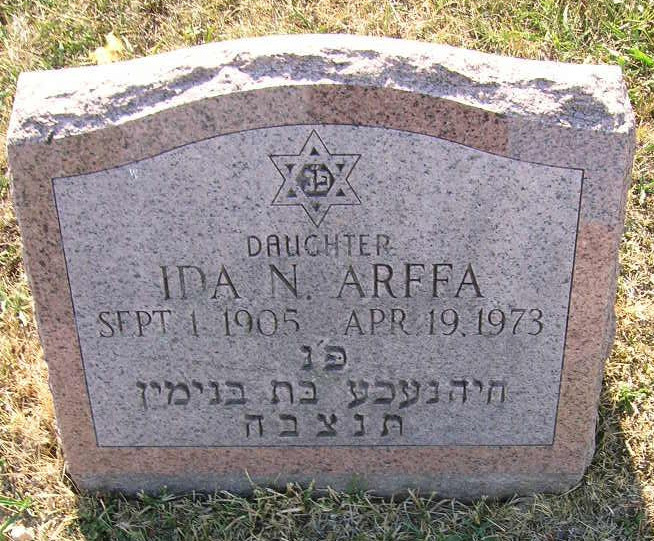 Mrs. Arffa and her late husband, Emanuel, had been real estate brokers here for several years. She was a member of Temple Adath Yeshurun, the sisterhood of the temple and the local, state and national board of realtors. Surviving are three sons, Gerald of Schenectady, David of Glendora, Calif., and Dr. Marvin Arffa of Sharon, Mass, three brothers, A. Solomon of DeWitt, Hyman J. of Rochester and Brig. Gen. Martin Menter of Washington, D. C.; three sisters, Mrs. Irving Pass of Chevy Chase, Md., Mrs. Maurice Brown and Mrs. Howard Nemerown, and seven grandchildren Services will be 2 p.m. today at the Birnbaum Funeral Chapel, Rabbi Milton Fierstein and Cantor Harold Lerner officiating. Burial will be in Adath Yeshurun Cemetery. Calling hours will be 1 to 2 p.m. today at the funeral home, 1909 E. Fayette St. Contributions may be made to the Temple Adath Yeshurun building fund.